Let’s face it, everyone is social media these days. That is exactly what makes it such a great tool for helping you find a job! There are three prominent reasons for using social media while on the hunt for a new job, job listings, networking, and recruiting. Two major social media platforms now feature job listings - Facebook and LinkedIn. LinkedIn, the preferred platform for hiring, is a professional network with a job search feature that allows you to search and apply for job openings using a variety of filters. LinkedIn will even email you new, related openings throughout your job search. Not only is it a great platform for networking and applying for jobs, it is also a convenient tool for keeping track of projects, milestones, and experiences throughout your career. In 2017, Facebook began testing out a job feature as an additional tool for business pages using their platform and by 2018, it had totally taken off. With over 60 million businesses using Facebook to market their business, products, and culture worldwide, it makes the platform a great place to hunt for new opportunities. You can upload your resume, allow Facebook to auto-fill your application, or manually enter your information to personalize it for each job opening. The tool also allows companies and recruiters to respond to you directly on the platform itself. Social media is one of the best online networking tools available so job seekers should take advantage. Maintaining professional relationships once your career takes you in a new direction can be hard and time consuming, but building a professional network online is the perfect remedy. LinkedIn is a great platform for connecting with professional colleagues and sharing achievements throughout your career, while most of the other options are suited toward friends and family, but still offering opportunities to interact with businesses. The best part of using social media as a networking tool? If done correctly and the time is right, simply making a “status” about looking for a new job opportunity could help you land an interview or at least connect you with a potential employer within a day or two! 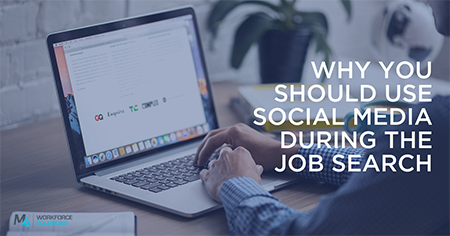 Staying active and keeping your profiles updated is important while searching for a new job, as social media has become a recruiting tool for many recruiters. Now that most of the U.S.’s working population uses social media, recruiters are seeking out talent on platforms such as LinkedIn, Facebook, Twitter, and even Instagram. When a recruiter seeks out a potential employee on social media, they are sometimes able to get a little insight into their personality, background, and work ethic before they have even gotten to the interviewing stage. While using social media as a career tool is a great opportunity, it can also keep you from getting the job. Make sure to keep your profiles and posts clean and professional. Employers can search social media for insight into your behavior, job history, attitude, and more. If a hiring manager finds negative posts or false information through your social media accounts, they may be less likely to invite you in for an interview, let alone hire you. On most platforms, you can alter your privacy settings to limit how much information potential employers will be able to access. Keep this information in mind when preparing for a career change or job search and make your social media work for you, not against you. What's the Best Approach to Screening Candidates? Why Should You Use a Recruiting Firm? Dealing with a Difficult Boss - What Can You Do? How Important is Human Resources Management? Is Segmented Diversity Recruitment Right for Your Company? Are Pre-Employment Personality Tests a Useful Tool for Hiring? What Can Companies Do to Avoid Making the Wrong Hires? How Can HR Impact Employee Engagement? What Impact Can HR Have on Performance Management? Employee Performance – Is there a magic bullet or no bullet? What is talent branding and is it necessary? Generation X and Y: are you satisfied with your recruiting strategy? Employee Retention – Is it time to re-evaluate your strategy? When should you relocate a candidate? Is it time to hire a recruiter? clients. You can reach us by phone, email or text message. © copyright M4 Workforce Solutions. Site design by ClearLogic.